You are children of the winds. At the beginning of time, the four great winds first gathered wanderers into four primeval clans. Now, though there are many more than four clans, each clan heeds first one of the four: the constant wind, the mountain wind, the cloud wind, or the hidden wind. The traditions of your people are humble compared to the majesty of the great Citadel Principalities. You hunt, you cultivate gardens, you trade crafts for tools from the Citadels, and you guide travelers venturing on the plains of the great rivers. But also, you watch. Because the children of the winds carry a secret. You know where Satan lies. The stories, only spoken by your people—for writing about demons is dangerous—tell how Satan fell from the world above, and how a mountain came in train, plummeting from the sky to seal the dungeon. Impossibly old now, the fallen mountain has been worn down by time, hunched, rising gently above surrounding hills. For uncounted generations, the magicians and doctors of your people have performed the rites which hold the dungeon doors fast. The children of the wind have kept this secret from greedy adventurers seeking wealth, wicked sorcerers seeking the council of Satan’s imprisoned lieutenants, and prideful princes from Citadel Principalities, which constitute hard dominion, leavened only slightly by internecine struggle. You have tolerated the capriciousness and cruelty of the magnificent Principalities, as sentinel legions require the riches of abundant fields. Strong armor and machines of war depend on towers of learning. The sentinel princes may water the plains with the blood of their brothers more frequently even than the flux of floods from the great rivers, but the legions also shield the great river plains from ignorant foreign kings. The Citadel princes’ role in the secret traditions is as custodian rather than sovereign, honing the blade of legions for times of exigency. But depredations have worsened. A detachment of Citadel cataphracts descended upon plains settlements, executed those that resisted, and enslaved anyone unable to escape. The remants fled to the hills around the fallen mountain. Following the attack, Citadel princes scour the hills for survivors. The magicians have been unable to perform the rites securing Satan’s dungeon, and divinations reveal the gates are weakening. The only way to maintain the prison will be to venture within, repair the wards, and reinstate the rites. Alternatively, there have always been people, even among the children of the winds, who object to the taboo against entering the dungeon. Some have wished to venture within to vanquish Satan once and for all. Others seek the power and magics hidden below. Such aims, or many others, could be yours, as the doorway stands open and the taboo abandoned. In a secluded glade, nestled in wild, rolling hills surrounding the worn, fallen mountain, lies the first doorway, the gate to Satan’s prison. The glade is the terminus of no path, but the children of the wind know the signs and incantations to find the way. The doorway is primitive, formed of three monumental, roughly-carved stones, two as post and one as lintel, set diagonally into the hillside, painted with white and red warding sigils. Your adventurers belong to a group of the displaced. You have constructed makeshift shelters, but your camp is precarious. 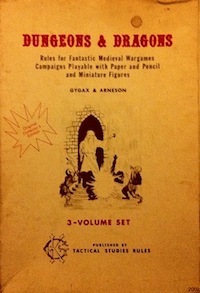 Each player should create one adventurer and two to four other escapees. For each session, you may bring another camp member as a support character. Replacement characters, if needed, will come from the camp. If a total party kill occurs and remaining camp population is zero, you lose and the campaign ends. Supporting or developing your camp and crafting gear will yield experience. Gear wears out. A few clans, mostly heeding the hidden wind, have metallurgists, but copper or bronze implements are more commonly trade goods from traveling princes. You will need to repair and craft gear. Within the high walls of the Citadel Principalities is foreign ground for children of the winds. Taking haven turns is impossible in a citadel. Entering a Citadel is equivalent to exploring a dungeon and will generally involve taking dungeon turns, as with other dangerous built spaces. Even communicating with the princes can prove challenging. Each Citadel speaks a different language, rather than the language that the children of the wind speak, which is an echo of the first language. Beware the princes, as their decadent ways have become inscrutable and Citadel panoply terrifies in battle. This entry was posted in Campaigns on January 26, 2019 by Necropraxis.